Well what do we have here, bargain hunters!? Remember when the Instant Pot DUO80 8 Qt 7-in-1 Multi- Use Programmable Pressure Cooker went on sale for Black Friday at a $42 discount and people went nuts over it? Well don’t worry if you missed that killer sale, because Amazon is running one right now that’s somehow even better. Hurry up and grab one before this deal sells out and you’ll find this king size 8-quart model for just $79. That’s a $61 discount, and it’s the lowest price we’ve ever seen. 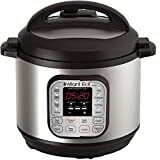 Of note, you can also snag the slightly smaller Instant Pot DUO60 for $67.99 right now.